Consider the evidence: The former JJ Newberry Department store has been repurposed into Steel River Playhouse. A onetime metal-weld building now houses a beautifully restored 1905 carousel. And its long-dormant rail lines were revived for the historic Colebrookdale Railroad. Best of all, the borough’s visionary leaders have done it again, assembling its first-ever GoFourth! Festival. As the two-day celebration culminates on July 4, Memorial Park will indeed be brightened by a colorful display coordinated to music. But the source of this spectacular isn’t shells being shot to a predetermined soundtrack. 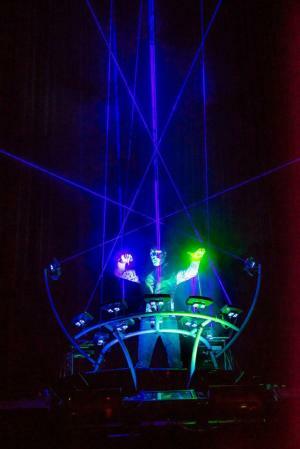 It will come from a high-tech musical instrument controlled by beams of light. Lariao has a long history with music, having accompanied bands that range from Yes to NSYNC. Currently, he performs all over the world as Mobius8. “I was out on the road with John Anderson of Yes, as extra on keyboards,” he recalls. “I was doing electronic music that nobody was much interested in. “And I had a dream one night that I was playing beams of light. And John was singing. Anderson collaborated with Lariao on designing the Hydra. “…just like the constellation or the multiheaded dragon from Greek mythology,” he explains. The Hydra operates like a Theremin, an electronic musical device. Theremin players vary pitch and volume with their hands, bringing them closer or further away from an antenna. Vibrato is possible by wiggling the wrists, and many 1950s sci-fi movies, eager to capitalize on its otherworldly sound, eagerly included the instrument on their soundtracks. The Hydra, Lariao describes, is “… like a digital Theremin; a laser works like a digital antenna. The reflection of the light and the change in that reflection sends information digitally to a computer to change pitch. Pottstown’s July 4 organizers didn’t have to do much convincing to get Lariao on the program. No matter his tour schedule, he traditionally came home to Montgomery County around July 1 for his mother’s birthday. That yearly Norristown celebration includes a performance times to end with the onset of fireworks in neighboring Upper Merion Township. “The Borough of Pottstown contacted me and asked if I’d be interested in doing my mom’s usual birthday concert in Memorial Park,” he laughs. “One of my first concerns was that they didn’t want to do fireworks. But I understood that they really wanted to do something new and take something to a new level and do something that’s more green. Fireworks are a lot of waste; you can’t reuse them and they make pollution and stuff. So I get it. One of the major advantages of this July 4 performance is that it is rain or shine. In fact, Lariao believes there is something special to playing in less-than-ideal weather. “High humidity and rain make the show a lot more visual,” he reveals. “It’s pretty incredible. When we shoot the lasers in the rain, they look like crystals falling from the sky. 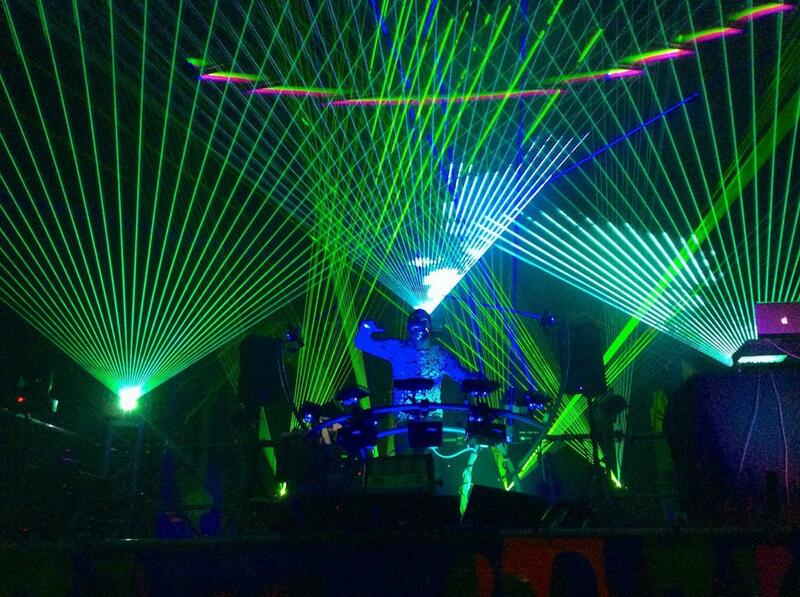 The lasers go for miles. They’ll just go until they hit a wall or a tree or something. “Last year, it was raining really hard during a show. And I was only going to play for 45 minutes. But nobody wanted to leave. I ended up playing for three hours. “I obviously had cover because I couldn’t use the electronics in the rain. So I was protected. And it was warm enough that everyone was just out dancing in the rain and having a good time. “People are still talking about what the lasers looked like,” he concludes. Lariao and his Hydra are booked in Pottstown for July 4 for 2017 and beyond. He is pleased to be appearing in the borough, which he cites for having a “great arts program” that he is eager to support. He’s also happy to be home again. The GoFourth! Festival includes a dunk tank, food trucks, colonial games at Pottsgrove Manor, mini historical tours, a reading of the Declaration of Independence, beer garden, kids activities, scavenger hunt, crafts, arts show and tethered hot air balloon lift-offs from the U.S. Hot Air Balloon Team. On July 3 at approximately 9 p.m., Mobius 8 will preview its laser performance, choreographed to music that includes a recording of the Pottstown High School Jazz Band. On July 4, the borough’s GoFourth! Parade begins at 10:30 a.m. on High Street, marching from Adams to Manatawny. At 4 p.m., the annual Duck Race floats down Manatawny Creek, raising funds for more than 20 local charities. The Mobius8 performance is at 9:30 p.m.
For a unique commute to the July 3-4 events in Pottstown, take the Colebrookdale Railroad from Boyertown. Departures on July 3 are at 5:30 p.m., 6:30 p.m. and 7:30 p.m. The July 4 trains leave at 3 p.m., 4 p.m., 5 p.m. and 8 p.m. Return trips to Boyertown follow the laser show performances both dates.